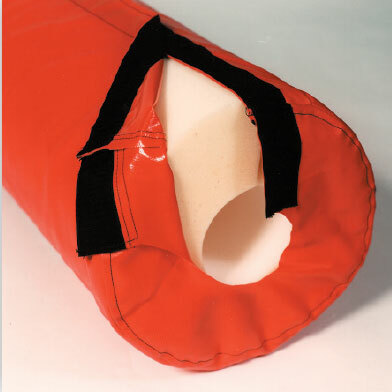 Call 800-877-1500 To Order Your Protective Padding Today! Z-Brackets provide an easy option for mounting panels to walls. They are optimal for both outdoor or indoor mounting and allow the panels to easily slide into place for quick mounting and unmounting. This is a great option if you are planning on taking your panels down and putting them back up. This will prevent damage and maintain the life span of the panels. Each panel will have a 1 inch nailing lip on top and bottom. This method will require 4-drill holes. 2 at the top and 2 at the bottom of each pad, used to attach to the wall. This is a more permanent solution. The panels can be taken down by removing screws holding them in place. This will result in leaving drill holes in the panels nailing lips. A frame my need to be constructed and installed to insure proper support for the pads. “U” Channel is another option. It requires mounting hardware that will stay in place on the wall. The panels can drop in from the top and this allows for easy mounting of the pads. It is recommended to use a 1 inch nailing lip at the top of the pad for added stability. These mats are the ultimate in flexibility and protection. 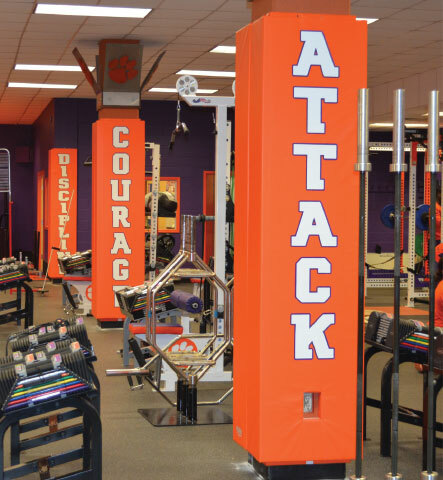 Hang them on the wall for protection in your gym, or remove the mats and use them on the floor for gym class. Easy to mount, easy to remove. 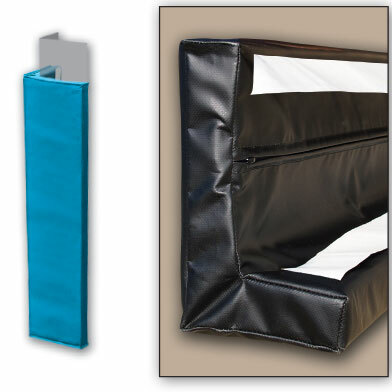 Comes with “U” channel mounting system unless otherwise specified.Folding sections are 2’ wide. Attach to concrete, wood, or metal stages adjacent to athletic surfaces are a danger to anyone in an active sport. Help protect your players from injury while dressingup your gym with beautiful, safe and practical stage pads. Stage pads are easy to mount and custom sizes are available. You can choose between permanent or removable mounting with logos and lettering available. Cut-outs can be provided for access to electrical outlets or other objects. Special pad designs are available. Custom made to fit any area, these specialty covers will protect your athletes and students from sharp, protruding corners and edges. Are designed to cover steel or concrete beams, protection on wall beams. Constructed with 2 inch polyfoam. 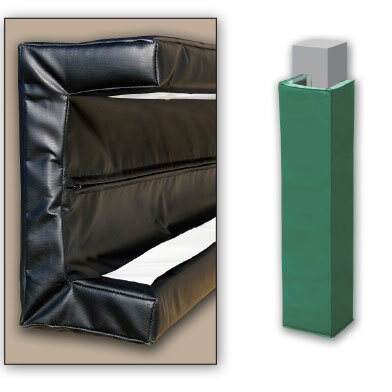 Are designed to cover door openings, sharp corners, or angled edges. Constructed with 2 inch polyfoam. Cover any type of rectangle post. Full protection on posts in active areas. Constructed with 2 inch polyfoam. 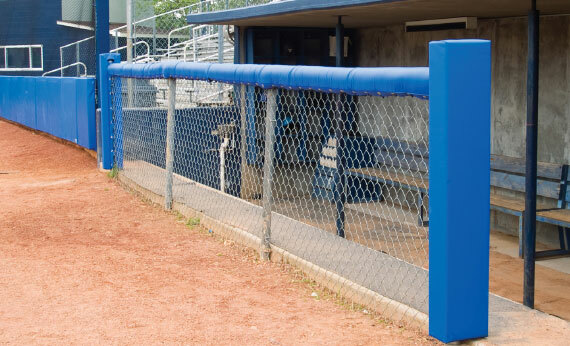 EWM and WPS series padding can be mounted to brick, concrete, wood or any solid surface, but they also easily mounts to any chain link fence. The EWM series has brass grommets at the top and bottom for mounting. 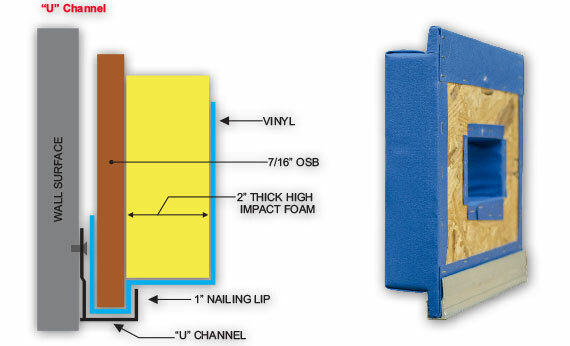 The WPS series padding is Wood Backed and is supplied with 1” nailing lip at the top and bottom. 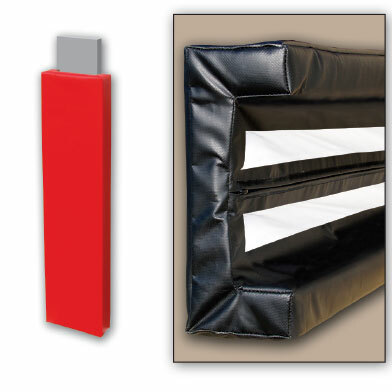 Optional “Z” or “U” channel hardware is available for mounting WPS series padding to solid surfaces. Nailing lips are not needed when mounting with “Z” brackets. 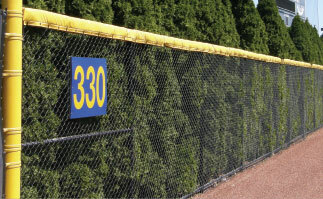 Attach Backstop padding to your fence to ad school spirit to your field with custom graphic, school name, or mascot. Backstop pads are constructed out of 18 oz. vinyl in a variety of colors. Vent/Weep holes at the bottom of all pads allow for water drainage. 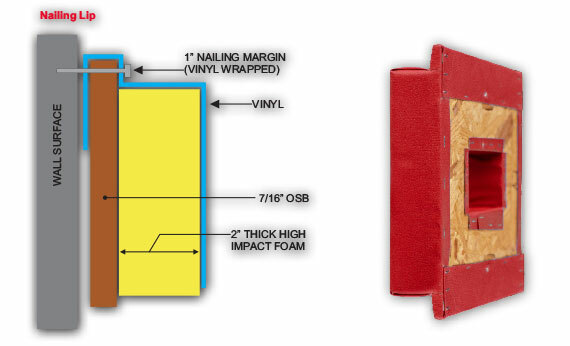 Custom sizes are available in the WPS, PSMS and EWM series padding. BSPs come standard at 3’ & 4’ height. Widths vary from 6’, 8’, 10,’ to 12’. These are available in 2” and 3” foam. 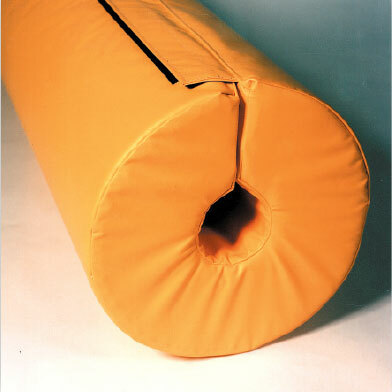 All padding is made in 2 foot folding sections for easy shipping and installiation. If there are any questions or concerns about this item it is best to discuss the details of your order with one of our knowledgeable sales advisors. According to NCAA, 3” backstop padding is always required. It should be a minimum distance of 25 feet and a maximum distance of 30 feet from home plate. 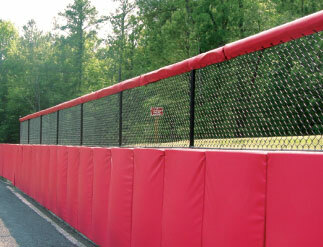 It is recommended that the backstop be vertical and not extend over the playing field. 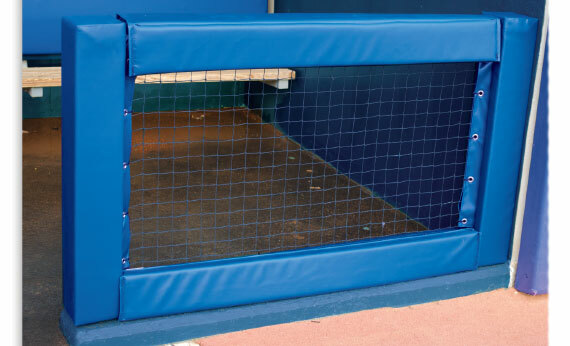 When the backstop is wood, cement, or brick, it is strongly recommended that it be padded from dugout to dugout no higher than 1 foot off the ground and extending to the top of the wood, cement, brick or 6 feet from the ground, whichever is shorter. 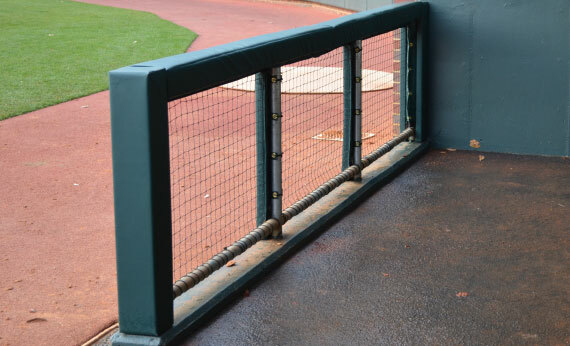 Protect your athletes from the hard, sharp edges of rails and other obstructions with rail padding. Padding gives your facility a finished look and added safety. We provide padding for fences, rails, and poles. We also offer custom manufacturing to meet your facility’s unique needs. Padding is available in 16 colors and standard and custom sizes. Logos and text options are a great way to upgrade your venue, advertise, and promote your school and sponsors. Vertical Post Pads and Square Rail Pads are ideal for art work. 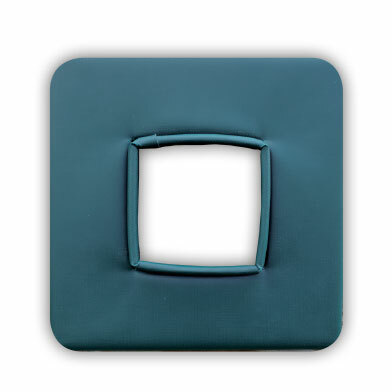 We offer multiple installation methods including pipe strap and “C” clamp attachments, as well as grommet flaps and hook and loop for easy installation. Rail pads are grommeted down the sides, used for ease of installation on round railing. Closed cell foam is used to ensure durability. Rail pads are available in 4’, 6’, 8’, 10’ sections. Custom sizing is available upon request. Standard pads fit 1-1/2” to 2-1/2” diameter rails. Covers made with grommets. Standard pads fit 1-1/2” to 2-1/2” diameter rails. 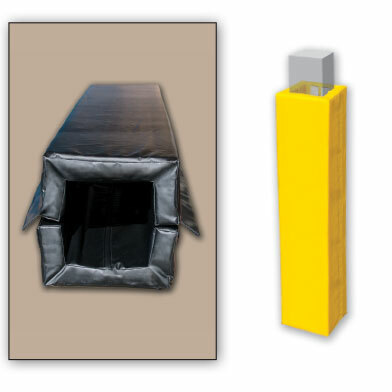 Vertical Post Pads are manufactured to your specific needs and sizes. 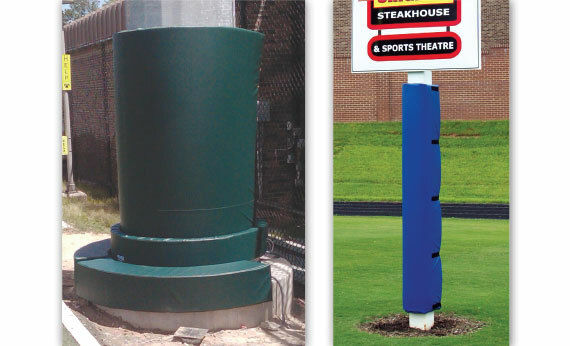 Vertical post pads feature a rectangular design for upright posts. A cleaner look for areas with joining pipes. They are covered in 18 oz coated vinyl. Closed cell foam is used to ensure durability. 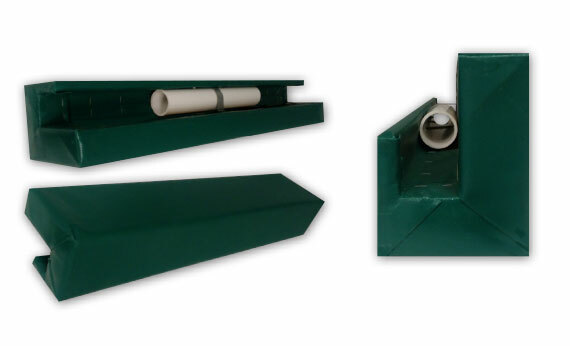 Square rail pads are available in 4’ to 8’ sections. Custom sizing is available upon request. Standard pads fit 2” to 3” rails. Pads are mounted with pipe clamps or grommets. Measurments are taken from the inside of the pads. Inside dimensions of 4” front x 3” top x 3” back make outside dimensions of 6” front x 5” top x 4” back. Wood backed P-CAPS made with grommets. Sealed on 3 sides with the 4th side attached to the the rail. Standard pads fit 2” to 3” rails. 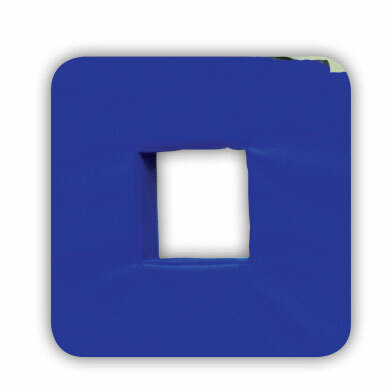 P-CAP Pads are manufactured to your specific needs and sizes. They are covered in 18 oz coated vinyl. Caps can be designed to extend over rail top to accomodate for finials. 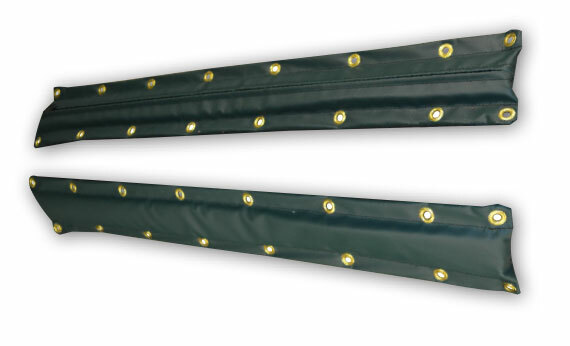 This specialty pad is 13” wide x 10’, 12’, or 14’ long with grommets every 6”. Made with 1” closed cell, high density foam padding and 18 oz. vinyl that comes in a variety of color choices. These can also be made in custom sizes to suit your every need. 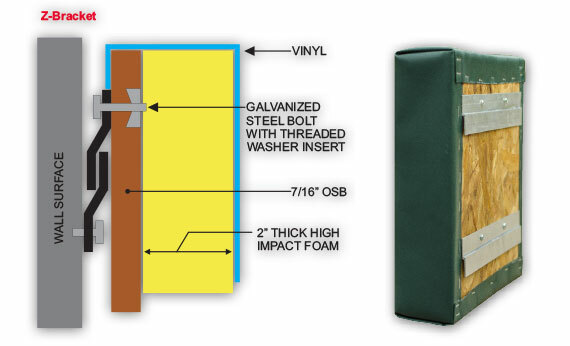 Custom Bench Pads are built to fit your dugout bench specifications. Bench Pads are made with 18 oz. vinyl offered in a variety of colors. 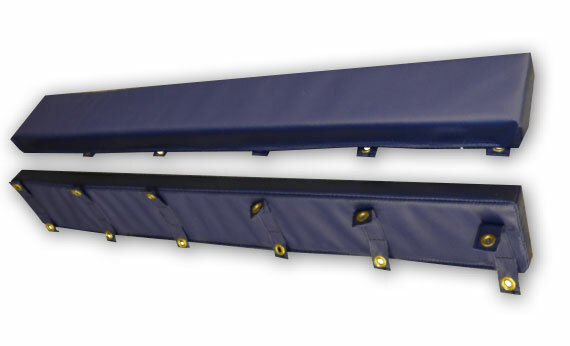 Our Tower Padding is made using Non-wood backed with hook and loop series padding, and is ideal for protecting athletes from obstacles on your practice fields. 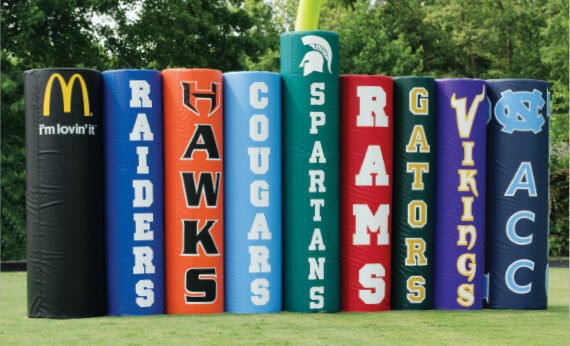 Turn hazards such as poles, stands and towers into a source of school pride by adding custom logos and lettering.